Today is my birthday. Today is also the start of a brand new year. And today is the day that we'd expected our baby girl to arrive. She had other plans though, and after over 30 hours of labor beginning last Thursday night, Essley Morgan Williams was born at 3:42 AM on Saturday, December 28th. She weighed 8 pounds 1 ounce, measured 21 inches, and had a full head of dark brown hair. She is the best birthday present ever, hands down. I am so in love that I feel like my heart might explode. I won't lie - labor was the most difficult, surreal experience of my life. I did 25 of the 30 hours with no pain medication, and by the time I gave in and got it, I was violently shaking and throwing up. But the second I saw Essley, I forgot about all of it. Immediately. I am still in a daze (the word 'exhausted' doesn't begin to describe it), so although I do plan to share more of our story with you guys, I hope this quick update will suffice for now. I have only been a mom for four days, but I can say with 100% certainty that it is the best thing I've ever done. Happy New Year from me, Robbie, and Essley Morgan. I can't wait to see what this year brings. Congratulations on your beautiful baby! Happy 2014! Congrats! What a beautiful baby and Happy New Year to you and your family. She was born on my Nanna's birthday!!!! A sweet little Capricorn. I'm so in love with her. She looks just like yall!!! You are a trooper love! Much love to the 3 of you this new year!!! She is so gorgeous just like her mama! Happy new year and happy birthday! Congratulations! What a wonderful tribute to both your grandmother and your sister. Lots of joy and happiness for your family. Happy Birthday To You and congratulations on the birth of Essley, I love her name!!!! I can't wait to hear more!!!! Oh yay Congratulations! She's so lovely, and her head of dark hair is adorable! Happy Birthday! Happy New Year! And welcome to sweet baby Essley Morgan!! 30 hours of labor!??! Ouch! At 8 lbs 1 oz, it is a blessing she did not go full term. Best wishes for such a wonderful start to the year. She's as beautiful as her name (and mama)! So happy for you. Enjoy your sweet girl. She's absolutely beautiful! Love the name. Congratulations! Happy Birthday, Happy New Year & CONGRATS on welcoming Baby Essley Morgan. Thank you for introducing her to us today. =0) She is a beauty! Congratulations Melissa and happy birthday too!! Essley is such a sweet baby girl, and if I may say so...she looks like you :) wishing you the happiest and fulfilling year ever, many blessings!! Congratulations! I remember those first days as the absolute best of my life, forever! Enjoy every second, Melissa! Yay! She is so beautiful! Love her name :) And you are one strong mama for doing 25 hours without meds! Congratulations! She's beautiful! :-) I hope the three of you are enjoying your time together as a new family. Beautiful girl! Congratulations! Hope you all stay happy and healthy! Happy New Year! Happy New Year to your lovely family! You truly did get the best present this year! Congratulations! Such a wonderful name, I love unique names. My middle name is after my great aunt! Melissa!!! She is lovely! Congrats to you guys - this is going to be such a great year for you. Cherish every single second with your baby girl. Love her name and the special meaning behind it!! Thank you all again for your comments and messages. It means a lot to us! I love her name and the meanings behind it! you are a trooper! such a sweet little family! 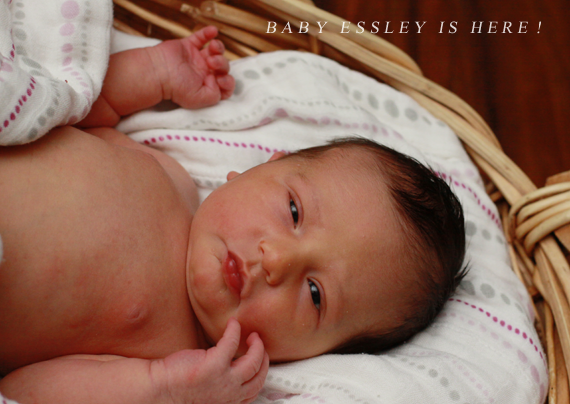 Essley is so beautiful- we're sending lots and lots of love! She is soooo pretty! Congratulations! happy birthday essley & dear melissa! sending love :) you did it. hooray for morgan the amazing sis. glad you're all ok. Awe...so SWEET! Congrats to you and the family!!! !